Many water leaders face a conundrum – they know massive system investments are needed, but have a steep hill to climb to gain necessary approvals and rate recovery for such investments. Stand-alone, multimillion dollar technology programs often take a back seat to repairing and replacing aging distribution system assets. However, it is possible to economically replace aging assets and implement greater levels of intelligence and security across systems – utilities just have to take a comprehensive, rather than piecemeal, approach. 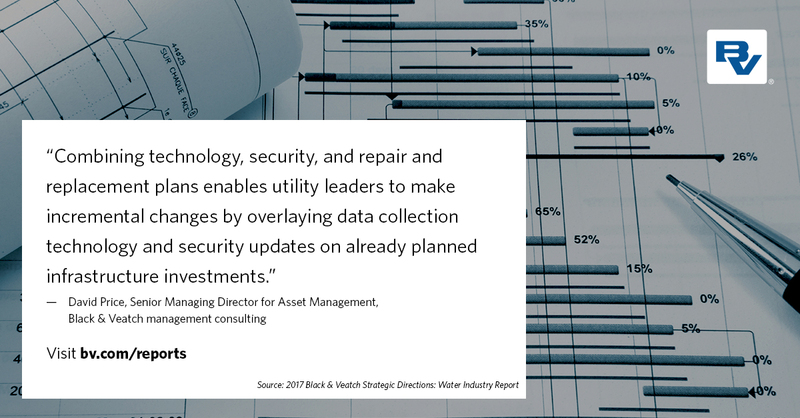 Combining technology, security, and repair and replacement plans enables utility leaders to make incremental changes by overlaying data collection technology and security updates on already planned infrastructure investments. In the years ahead, it will be even more important to add design intelligence into assets, rather than limiting the industry by replacing like with like. This year’s Strategic Directions: Water Industry Report data show that more and more, utility leaders are considering a formal asset management program to create cost efficiencies, enhance service levels and extend asset life. Every utility, regardless of technologies used, generates tremendous amounts of data. However, challenges exist in creating the functionality to use existing data and consistently capture and store data to identify and remediate data gaps. Identify Critical Asset Data – Some utilities are identifying their most critical asset data through an “asset health index” that examines overall health including inspections, repairs and parts replacements. Understand the Gaps – Collaborating with IT experts can help utilities design the best solutions for a particular utility, whether it be managing the volume of data points available or gaining consistent input across multiple systems. Fix the Data – Mining data from multiple databases and integrating information with algorithms provides valuable analysis to inform intelligent decision-making. Fix the Process and Change the Work Culture – Training professionals throughout a utility on monitoring equipment and outputs will be key to inculcating a “culture of respect for data” in the workforce.